Kolkata: Lodging her protest against the overnight withdrawal of ten companies of the central paramilitary forces by the Centre from Darjeeling, Chief Minister Mamata Banerjee shot off complaint letters to Prime Minister Narendra Modi and Union Home Minister Rajnath Singh on Monday. She also called up Singh and conveyed her grievances to him. Disapproving of the Centre's decision Banerjee said, "When peace was discussed to maintain normalcy in the hills, the issue of withdrawal of ten companies of central forces by the central government came up following a letter on October 15. It was done without informing or consulting the state government. We have made it clear that we are not at all happy." She was speaking to the media at the state secretariat Nabanna after holding another round of talks with the hill party leaders to bring back peace in Darjeeling. Banerjee elaborated, "I wrote to the PM and Union home minister saying that the withdrawal of the central forces is very unfortunate. We are really shocked. It is an unfortunate part of the Government of India to withdraw its forces unilaterally." She mentioned, "I personally talked to Rajnathji also. Politically, it is a bad decision and administratively too. It takes time to restore normalcy." Referring to the recent visit by state BJP president Dilip Ghosh to Darjeeling, the chief minister continued, "All know what happened in the hills following a visit by a BJP leader there. I do not want to discuss it now." Expressing her disappointment Banerjee added, "I feel the decision about the withdrawal of central forces was taken on the basis of the report of the BJP party after one of our young cops was killed. Few foreign countries are involved along with some militant outfits of the North East. The arms came from them. It is a very serious question. Darjeeling-Siliguri is the chicken's neck." According to her, the corridor is also the gateway to the North East apart from countries like Nepal, Bhutan and Bangladesh which should not be treated politically. The chief minister even claimed of a BJP minister's hand in the unrest in Darjeeling. Without taking his name she mentioned, "He is totally involved in it. The BJP is trying to disturb Darjeeling repeatedly. But we do not want Darjeeling to be disturbed." Banerjee alleged, "When the withdrawal of the central forces came into effect, the BJP wrote a letter to Union home minister to congratulate him. It is now clear who is right and who is wrong. In such a situation, dialogue is the best option for a way-out. But they don’t care to contact in federal structure. It was a political decision which was taken at the behest of the BJP state party office." She argued that the state government can ask for the deployment of CRPF or BSF within the ambit of federal structure. Banerjee alleged, "To the central government, BJP party office is more important than the state and the country or the federal structure or my hill people. It is a political game-plan and conspiracy by the BJP to divide and destabilise Bengal." In the backdrop of Union home minister's meeting with Gorkha Janmukti Morcha (GJM) leader Roshan Giri in New Delhi she wondered why the Centre can not sit for dialogue with the elected representatives when it met an accused of UAPA charges. "Some UAPA accused can be called for talks but not the political parties working here or the MLAs and MPs of my party or the MLAs of Darjeeling," Banerjee pointed out. 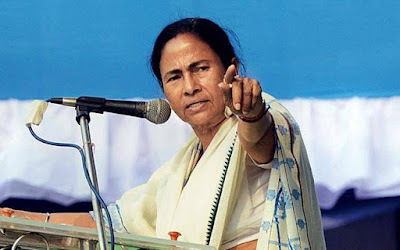 Lodging her protest against the overnight withdrawal of ten companies of the central paramilitary forces by the Centre from Darjeeling, Chief Minister Mamata Banerjee shot off complaint letters to Prime Minister Narendra Modi and Union Home Minister Rajnath Singh on Monday.